Aside from the popular Cass Scenic Railroad, West Virginia's rail attractions remain largely unknown. This is unfortunate given the state's rich history and available options. But, things are changing. The West Virginia Central, based in Elkins, has steadily grown into a popular tourism destination. Today, the company hosts several different trips, ranging from dinner trains to holiday themes; other locations include the Durbin & Greenbrier Valley in rural Durbin (hosting short excursions pulled by a restored Climax geared steam locomotive) and the Potomac Eagle Scenic at Romney. 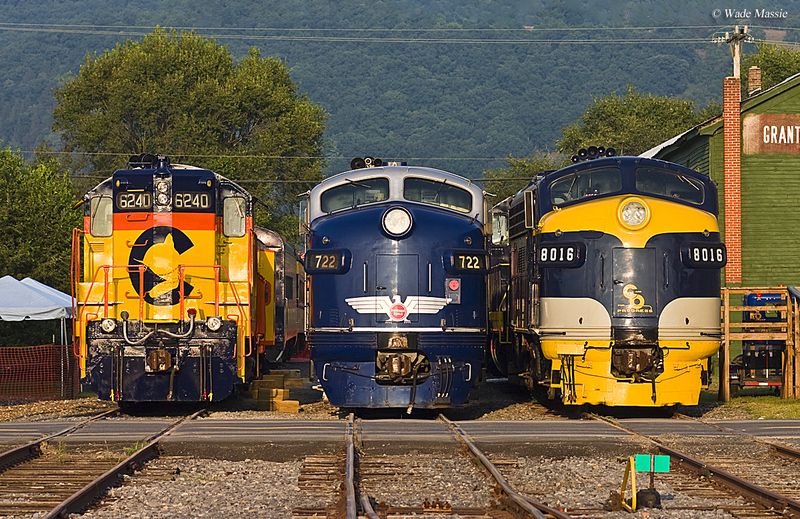 West Virginia's heritage with the iron horse began as the Baltimore & Ohio pushed ever westward from its home city. Many railroads would eventually reach the Mountain State, which once boasted five main lines and numerous coal branches; these included the Baltimore & Ohio, Chesapeake & Ohio, Virginian, Western Maryland, and the Norfolk & Western. Please note! The information here includes only tourist attractions. If you are interested in intercity rail options please visit Amtrak's website. Before June 20, 1863 West Virginia was a component of Virginia. As such, its rail history is somewhat tied to the Cavalier State whose first was the Petersburg Railroad. This pioneer road was chartered in 1830 to connect its home city, near the Atlantic coast, with southern points. The first system to penetrate the border of what is today West Virginia was the venerable Baltimore & Ohio, our nation's first common-carrier. After the B&O launched service over its initial 1.5 miles from a small station in Baltimore at Pratt Street during January, 1830, the railroad set out westward for Wheeling, Virginia to complete its original charter. This growing western frontier community sat along an important waterway, the Ohio River, and the National Road, America's first major highway that was completed from Cumberland to St. Louis, Missouri in 1837, a distance of 620 miles. As the 1830's progressed the B&O continued west, reaching Frederick in 1831 (via a branch) and Harpers Ferry, Virginia in January, 1837 (following a completion of a bridge spanning the Potomac River). The railroad's attempt to complete its charter proved agonizingly slow due to funding issues and engineers' struggle to locate a suitable grade through the rugged Appalachian Mountains. Under the new direction of Thomas Swann, the railroad headed southwestward from Cumberland until reaching the small community of Bridge Valley (later Grafton). From there, the route turned slightly northwesterly along the Tygart Valley River to Fairmont. Finally, Wheeling was reached in 1852. By the 20th century, the B&O dominated northern West Virginia; it would open a main line to St. Louis via Parkersburg and operated hundreds of miles of secondary coal branches throughout the region. It was joined by the Western Maryland Railway (WM) which headed south from Cumberland to Elkins, a town which blossomed into a major WM coal terminus. There was also the C&O, Virginian, and N&W serving rich coal seams in the state's southern periphery. Historian John Stover's book, "The Routledge Historical Atlas Of The American Railroads," notes the state's mileage peaked at 3,996 in 1920. 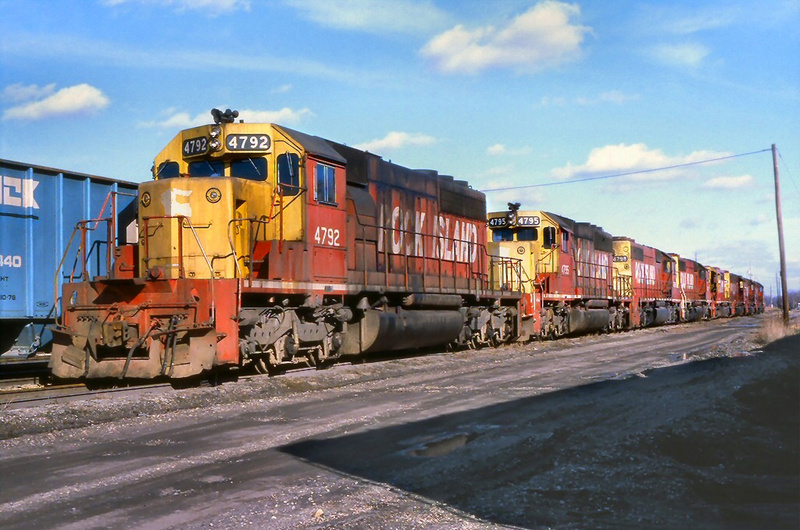 Today, the Association of American Railroads lists only 2,214 miles remaining, following the abandonment of coal branches and components of other through routes. 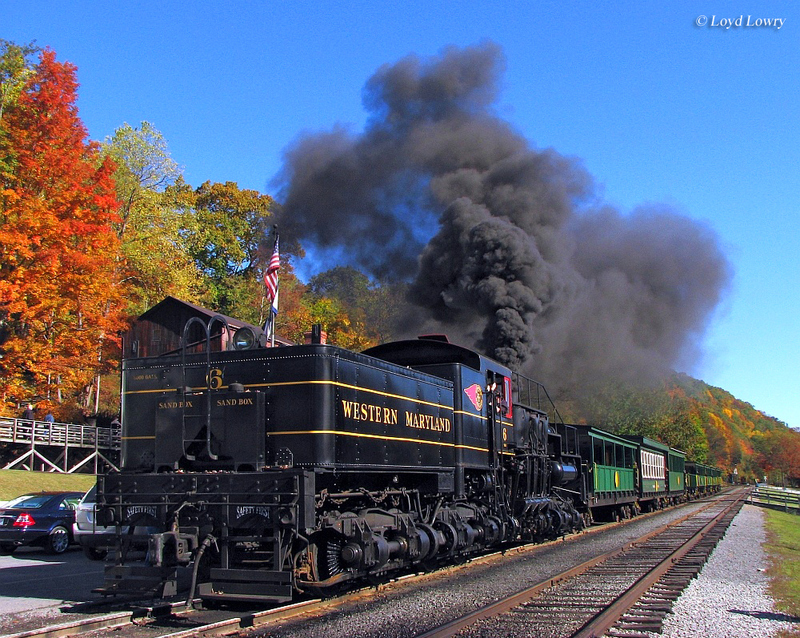 West Virginia's history with modern-day tourist railroads began in the early 1960's when the Cass Scenic Railroad opened to the public over tracks that had long been used for logging purposes. 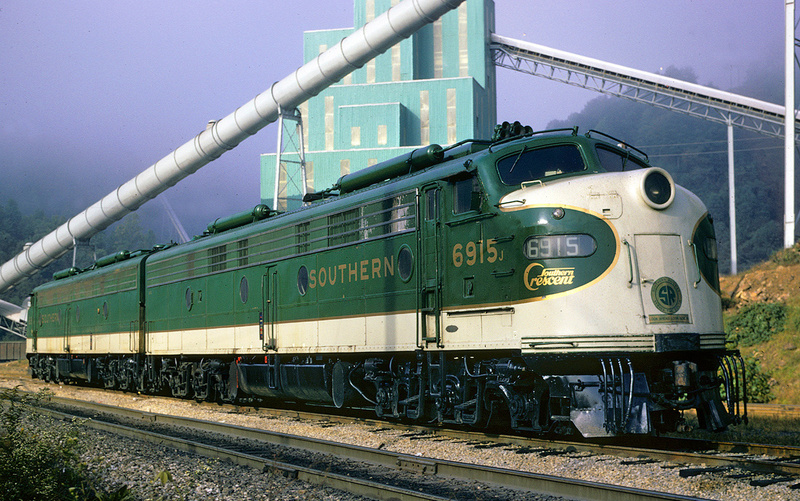 The seeds of which became Cass Scenic were planted by Russell Baum in 1960, a local railfan from Sunbury, Pennsylvania. He had a longtime interest in the old logging operation and wished to see it preserved for future generations. It took a few years but he was eventually successful in convincing the state to acquire the property as a state park. The new Cass Scenic Railroad, which began as just a novelty, launched service on June 15, 1963. Today, the state is home to four excursions and all offer something a little different, from dining aboard the West Virginia Central and Potomac Eagle Scenic to open-air cars on the Durbin & Greenbrier Valley. 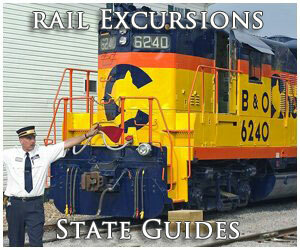 To learn more about all West Virginia train rides please read on below. 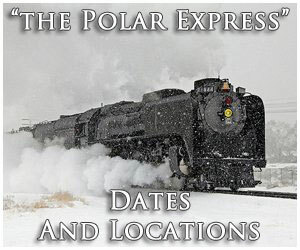 Finally, if you are interested in excursions that pertain to specific events, such as "The Polar Express," Halloween, Thomas the Tank Engine excursions, or fall foliage events please visit the main tourist trains section of this website. 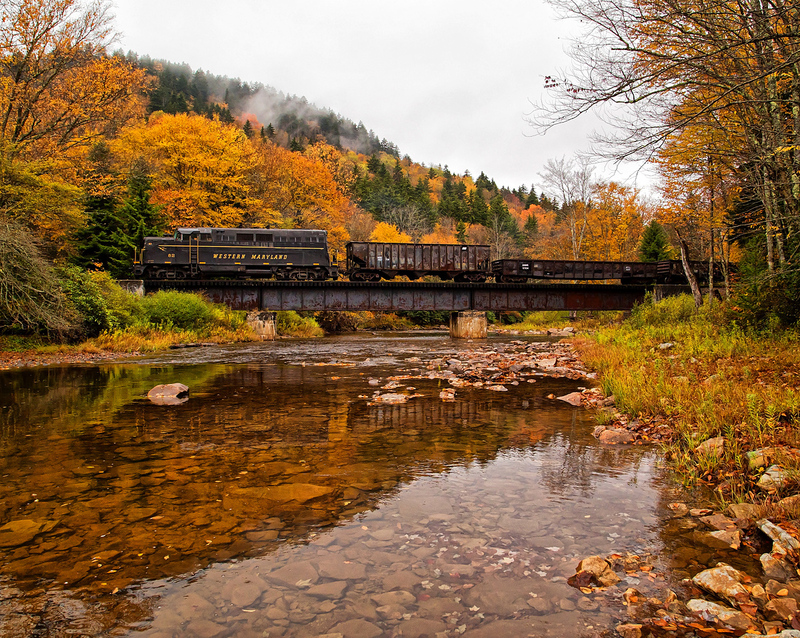 Without question, Cass Scenic is the most popular train ride experience in the Mountain State. It officially debuted on June 15, 1963 via a few miles of former Mower Lumber Company logging trackage in Pocahontas County. Today, the railroad operates a fleet of geared steam locomotives and has rebuilt more than a dozen miles of track reaching Bald Knob and the former town of Spruce where it connects with the West Virginia Central. To plan a trip please click here. Located in the historic town of Harpers Ferry at 937 Bakerton Road this museum is well-known for its large collection of classic toy trains that date back to the 1930's, and some even earlier. They also offer a popular miniature train ride on the grounds. While there be sure and check out the live railroad action of passing CSX, Amtrak, and MARC commuter trains. The little Durbin & Greenbrier Valley, sometimes forgotten because of its small size and out-of-the-way location, uses a short section of the Chesapeake & Ohio's former Greenbrier Branch to host train rides south of Durbin (where the railroad once connected with the Western Maryland). From the town's restored C&O depot, the D&GV operates a restored Climax geared steam locomotive. 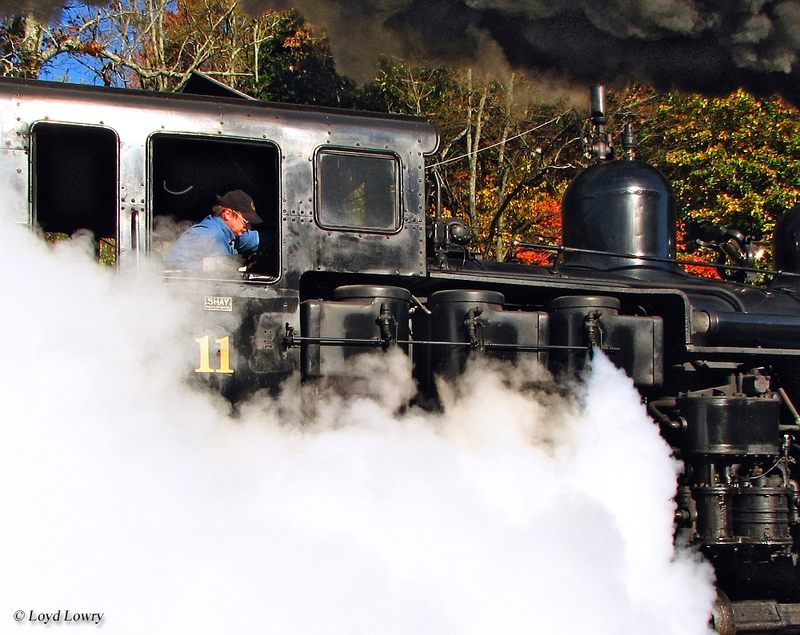 The little railroad is working hard to reestablish a connection with the nearby Cass Scenic Railroad. This toy train museum is based in another historic West Virginia city, Wheeling, once an important terminal for the B&O. They house a large collection of different gauges from O and G to HO, as well as operating layout to see. To learn more please visit their website. This WV train ride is hosted each fall by the Collis P. Huntington Historical Society and has been for several decades. The trip was once pulled by steam locomotives but today Amtrak diesels are regularly assigned. 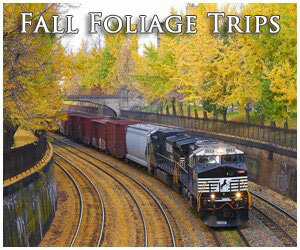 The excursion passes through the state's beautiful New River Gorge during the peak fall foliage season. To learn more please visit the train's website. Train rides in WV are defined by their bucolic, rural settings and magnificent views of the beautiful Appalachian Mountains. This has held true since our country's first common-carrier, the Baltimore & Ohio, arrived in Harpers Ferry, Virginia (West Virginia after June 20, 1863) in 1837. The B&O was the primary service provider throughout the state's northern counties while the southern/eastern regions were covered by the Western Maryland, Chesapeake & Ohio, Norfolk & Western, and Virginian Railway. Excursion possibilities are provided primarily through John and Kathy Smith's Durbin & Greenbrier Valley enterprise; it began with a short component of the Chesapeake & Ohio's Greenbrier Branch which hosted short trips behind a restored Climax geared steam locomotive. 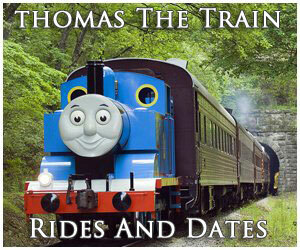 Today, this WV train ride attraction is still available, which departs from the preserved C&O depot in Durbin! The Smiths also operate the popular West Virginia Central in Elkins as well as the nationally recognized Cass Scenic Railroad in Cass. 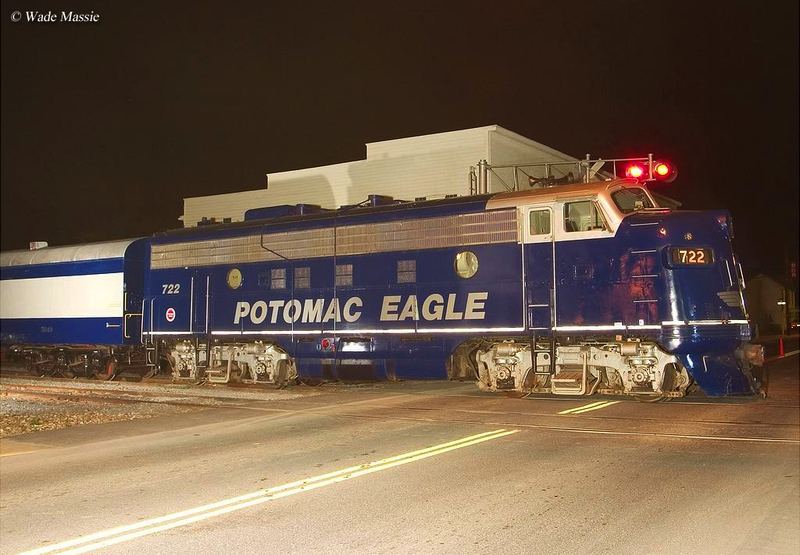 Also be sure and catch a ride on the Potomac Eagle Scenic in the state's Eastern Panhandle, long regarded for numerous sightings of Bald Eagles along the South Branch of the Potomac River. This zoo is located at Wheeling's historic and well-known Oglebay Park & Resort. On the grounds they have an impressive, 1,200 square-foot O-gauge layout to peruse. Be sure and check it out if you're there! To learn more please visit their website. Among the handful of West Virginia train rides available, the Potomac Eagle Scenic is the only located within the state's Eastern Panhandle. It utilizes a branch line originally owned by the Baltimore & Ohio. It meanders along the South Branch Potomac River with surprisingly incredible scenery within the state'e less rugged regions. The tourist line is best known for its regular sightings of Bald Eagles. To learn more please visit their website. The WVC has established itself as one of the premier WV train rides. While its official name is often unknown by the general public it operates former branch lines of the historic Western Maryland Railway which radiated south, east, and west from Elkins into the Mountain State's rugged hills. The company is located in the town's restored WM depot and now offers a wide range of trips from short excursions to dinner trains. One can now also even reach Cass Scenic by rail! To learn more please visit their website.